Widely distributed across much of North America from Alaska south to California and Mexico, east to Montana, Wyoming, Colorado, and New Mexico, and irregularly to Michigan and Quebec. From sea level to subalpine zone in moist and wet soils. Main limiting factor is moisture. Relatively common in wetlands, riparian habitats, thickets, and moist forest or woodland clearings . Long-lived competitor. Has high seedling vigor and moderate growth rate, but low seed abundance and no vegetative spread. Endangered in Wisconsin and threatened in Michigan. 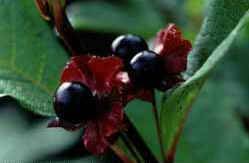 Collect fruit in August or when it turns black and extract seeds by maceration in water. Seed is tan at maturity. Keep fruits in plastic bags under refrigeration until cleaned. Cold stratification required 2-6 months. Preparation recommended: give 48-hour water or soak seeds in water 12 hours prior to cold-moist stratification. 1-3 C in sealed containers for long-term storage. Cuttings, bare root, or container plants grown from seed or cuttings. Seed: Sow seeds as soon as ripe in cold frames. When seedlings are large enough, plant directly into permanent positions in late spring or early summer. Cuttings: Collect hardwood cuttings .5 inch in diameter and at least 10 inches long with 5 or more nodes, between November and mid-January before any sign of budbreak.. Treat with rooting powder. Plant in flats in greenhouse and water until roots develop. Transplant to containers in about 50 days. Fine to medium textured moist soils. Plants grown from seed or cuttings. Moderate growth rate and long lifespan (20 or more years). Esser, Lora L. 1995. Spiraea douglasii. In: U.S. Department of Agriculture, Forest Service, Rocky Mountain Research Station, Fire Sciences Laboratory (2003, April). Fire Effects Information System, [Online]. Available: http://www.fs.fed.us/database/feis/ [April 23, 2003]. Evans, Jeff; Wick, Dale. 2001. Propagation protocol for production of containerLonicera involucrata (Rich.) Banks. ex Spreng. var. involucrata Banks. ex Spreng. plants (172 ml conetainer); Glacier National Park, West Glacier, Montana. In: Native Plant Network. URL:http://www.nativeplantnetwork.org (accessed 23 April 2003). Moscow (ID): University of Idaho, College of Natural Resources, Forest Research Nursery. Jacobsen, A.L. 2001. Wild Plants of Greater Seattle. Arthur Lee Jacobsen, Seattle, Washington. Spurr, Joy. 1978. Wild Shrubs – Finding and Growing Your Own. Pacific Search Press, Seattle, Washington, 95p. DeBell, D.S. USDA Forest Service Silvics of North America, Agricultural Handbook 654, Volume 2: Hardwoods, Populus trichocarpa. USDA Forest Service. (http://www.na.fs.fed.us/spfo/pubs/silvics_manual/table_of_contents.htm). [Online April 23, 2003]. involucrata (Richards) ssp. ledebourii (Esch.) Zebel plants (Deepot 40); Golden Gate National Parks, San Francisco, California. In: Native Plant Network. URL: http://www.nativeplantnetwork.org (accessed 23 April 2003). Moscow (ID):University of Idaho, College of Natural Resources, Forest Research Nursery. University of Idaho, College of Natural Resources, Forest Research Nursery.